For a limited time, we are offering a website, hosting, domain name, professional email & continual website care, maintenance & optimisation for only $200 per month. Check out what you get below! Here's what it could look like! 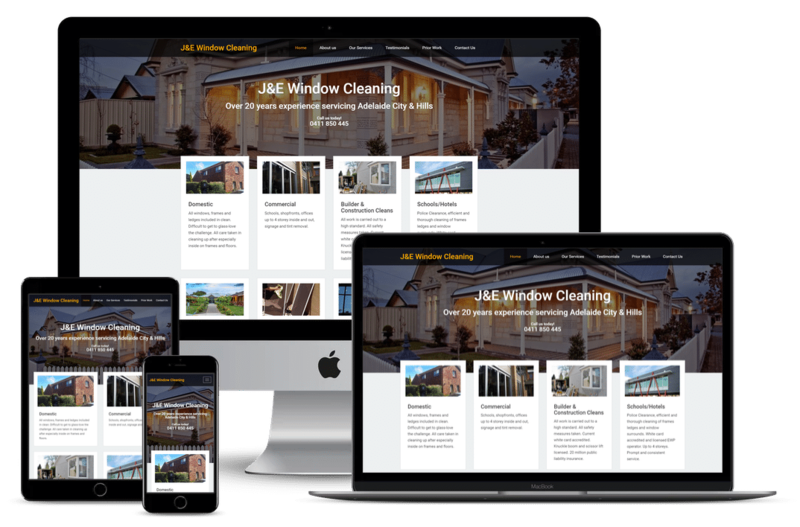 View the J&E Window Cleaning website. It's quick, local & included free. We pack a lot of features into our 'Lite' hosting package. All our hosting packages take advantage of SSD technology for storage. This means your website content gets served faster. It is the fastest disk performance possible. All hosting plans come with a cPanel account that you can manage yourself. If you would rather have professionals deal with it, we will take care of everything. No additional cost. We use a premium DNS service to point your domain to our hosting servers. This results in faster websites, changes made resolve faster and your websites are more reliable. Our servers are located in Brisbane, Melbourne and Sydney. They are physically secure, carrier neutral, and redundantly powered along with a diesel generator on-site. Don't keep your viewers waiting. Our hosting is quick and you'll notice it. Our servers are optimised especially for Wordpress hosting for the quickest possible load times. Constant security monitoring to keep any nasty intruders out. Our servers have a firewall to keep out those who should stay out! We can also arrange SSL certificates. Our 'Premium' Care Plan packs a LOT of benefits. Here's what you get included. Free. Daily backups of your website stored on secure Amazon S3 servers so you can rest easy that if anything ever goes wrong we can restore your website quickly. Sign up to start working with us today. We promise you will thank yourself and wish you'd done it sooner! You fill in your details and we get in touch. We will explain things to you further to make sure you're completely on board. We will send you a contract. This outlines all the things that are included in the monthly package. You can exit the contract at any time! You're not locked in. Once the contract is e-signed, we can start setting up your hosting account and creating a fresh new wordpress installation for you. We will ask you for the content and send through a helpful guide to help along the way. Once the content is finished, we use it to fill in all the blank pages on your website. We will tinker with it until it looks awesome. Then it's pretty much done! Click the button below, then click 'view cart' and continue through the cart process.